Shatideva then left the jungle and went to the monastic university Nalanda, where he was ordained as a monk by the abbot. There, he studied the great sutras and tantras and practiced them intensely, but he hid all his practices. Everyone thought he did nothing but eat, sleep, and go to the toilet. But, in fact, he was always in a clear light meditative state. (IX.34) When a (truly existent) functional phenomenon or a (truly existent) nonfunctional one (its voidness) do not remain before the dualistic mind, then since the other alternatives cannot be the case, there’s full pacification into (a state) without mental aim (at the impossible). The Compendium of Sutras summarizes the main points of the sutras, while The Compendium of Trainings summarizes the sutra practices. The Tibetan translation of the former, as well as of Engaging in Bodhisattva Behavior, is found in the Tengyur, the collection of Tibetan translations of the Indian commentaries to Buddha’s words. According to Kunu Lama Rinpoche, The Compendium of Sutras was translated into Tibetan, but it is not to be found in the Tengyur. There were several commentaries written to Engaging in Bodhisattva Behavior, especially to the ninth chapter. The Tibetan ones come from all traditions, as this text is central to all schools of Buddhism in Tibet. In the Gelug tradition, Tsongkhapa’s Grand Presentation of the Graded Stages of the Path (Lam-rim chen-mo) relies very much on The Compendium of Trainings and Engaging in Bodhisattva Behavior, especially for the teachings on the exchange of self and others. Although Tsongkhapa did not write a separate commentary to Engaging in Bodhisattva Behavior, his GrandPresentation of the Graded Stages of the Path covers many points treated in it. His Essence of Excellent Explanation of Interpretable and Definitive Meanings (Drang-nges legs-bshad-snying-po) covers many points from chapter nine. His Totally Clarifying the Intentions [of Chandrakirti’s “Supplement to (Nagarjuna’s ‘Root Stanzas on)] the Middle Way'”(dBu-ma dgongs-pa rab-gsal) also relies strongly on it. Shantideva was an Indian Buddhist scholar who studied at the Nalanda monastic University in the eighth century C.E.i Little detailed information exists concerning Shantideva’s life, though certain anecdotes lend some insight into the workings of what must have been one of the finest and most independent scholarly minds in Mahayana philosophy. My philosophy teacher in Dharamsala, Geshe Dorji Damdul-laii, related to me one story in particular which draws an interesting portrait of Shantideva the monk and scholar. Before delivering an oral transmission of the Way of the Bodhisattva, known in Sanskrit as the Bodhisattvacharyavatara (or the Bodhicharyavatara in its abbreviated version), Shantideva was derided by the monastic community in general as a lazy and poorly studied man. Indeed, as far as the other monks at Nalanda could tell, Shantideva passed all his time either eating, sleeping, or using the bathroom. Eventually, this supposed reluctance to engage in the rigorous intellectual activity of the University began to sit ill with Nalanda administrators, and a plan was devised to expose Shantideva’s shortcomings in a rather public and embarrassing fashion. Nalanda officials approached Shantideva and asked him to take his turn in the public space of the University in order to deliver a teaching on some aspect of the Buddha’s word. Fully expecting him to decline the offer, the officials were shocked when Shantideva readily accepted. They were not aware that Shantideva’s three perfections, (eating, sleeping, and using the bathroom), were in fact the physical meditative vehicles by which Shantideva practiced the teachings of the Buddha, and that he had achieved an astounding level of realization as a result of his studied and disciplined practice. In any case, the Nalanda officials went about organizing a very large and well attended gathering in order to showcase what they were certain would be Shantideva’s humiliation. On the day of the teaching, the entire monastic community was assembled in front of the throne from which Shantideva was meant to deliver his address. According to legend, the throne was well over the height of Shantideva’s head, and no steps were provided in order to help him reach the top. 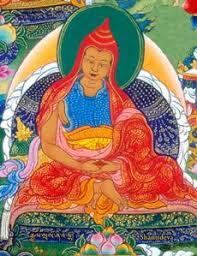 Much to the chagrin of his detractors, Shantideva showed no discomfort. He simply stretched out his hand and lowered the throne to an appropriate level, ascended, and raised it back again. Needless to say, certain audience members were beginning to realize their mistake. Shantideva proceeded to deliver one of the most profound and brilliant discourses concerning the bedrock concepts of the Mahayana path ever recorded in the Buddhist philosophical cannon. As he continued to teach, his throne ascended into the sky, and was greeted with the manifest presence of Manjushri, incarnate representation of the wisdom of all Buddhas. As Shantideva concluded his teaching, he disappeared from Nalanda, leaving his audience in stunned and silent reverence.